This is a great time of year to get out on Michigan rivers. The foliage isn't thick yet, and you can see the landmarks along the river banks. 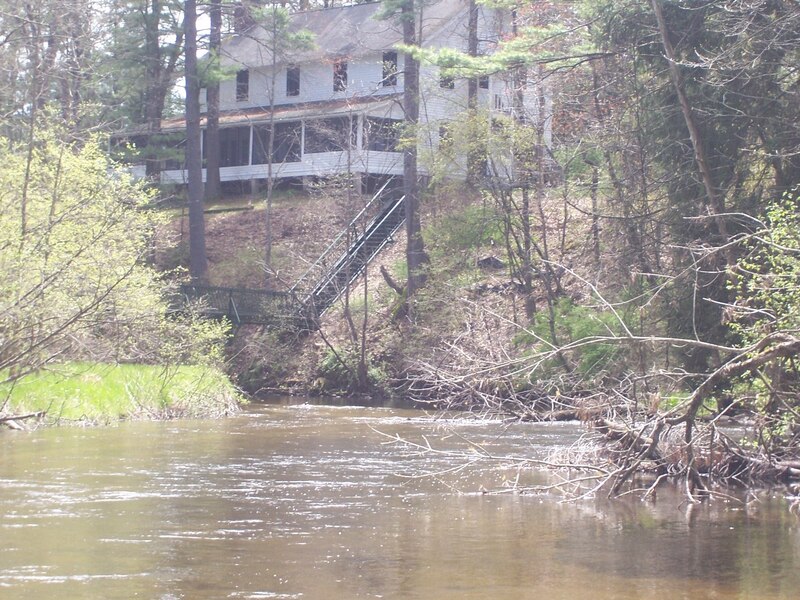 I love old houses or cabins on streamsides, like this one on the Pere Marquette River near Baldwin. The old houses speak of a different era when white pine was cheap, and it wasn't expensive to add a couple of extra rooms to a house, especially a screened in porch for use on summer evenings. The Pere Marquette is a joy to paddle, especially if you have your own boats. Floats range from four to six hours, which is pretty much an entire day, if you're fishing along the way, like I did, or even just sight seeing. In three days of floating, I caught plenty of large brown trout, and a few rainbows. Because the trees and other foliage wasn't up, I saw many deer and the bird watching was good. The morel mushroom season was on and there were folks in the woods harvesting them. A combination float trip/morel picking expedition would be a good trip. 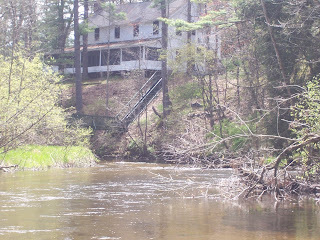 I stayed at the Pere Marquette Lodge in Baldwin, which offers rooms in the lodge, cabins and a few houses for rent. The cost was moderate, about $70 a night for a room. The folks in the fly shop at the lodge arranged for someone to spot my car, picking it up where I put my river in the boat and moving it to the take out spot to which I was headed. This is the "Flint Rainbow Club" formerly used as barracks used for soldiers in an era long forgotten- tons of history inside those walls.